Airwheel S8 two wheel electric walkcar wins not only from externality. When it comes to Airwheel S-series, they strike the players and buyers as incredible stability and extreme natural Airwheel ride ability. Airwheel has welcomed another member in Airwheel S-series-S8 two wheel saddle-equipped scooter on CeBIT 2016. Judging scooter from experience is frequently seen, especially among girls, while, Airwheel S8 sitting-posture electric scooter wins not only from externality, but also from its excellent performance. Though it bears much resemblance with Airwheel S6, Airwheel S8 electric scooter with seat still possesses its own defining features. Outfitted with large tyres whose diameter reaches as much as 10 in, Airwheel S8 is able to adapt to more road conditions, with brilliant traffic ability. The jumbo tyres enable Airwheel S8 to easily pass many kinds of tough terrains. Another major difference between S6 and S8 is the operating rod design. 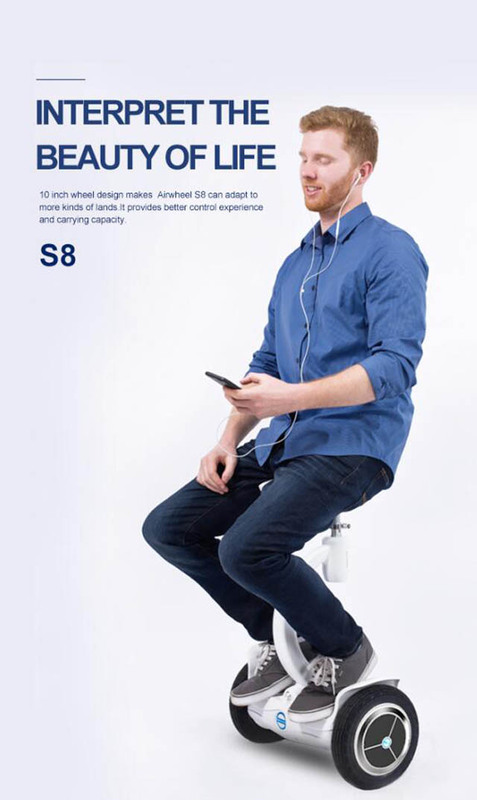 Airwheel S8 has replaced the I shaped design with the S shaped design. For one thing, the S shaped operating rod enhances the overall beauty. For another, it enables S8 double-wheels electric scooter to have better load capacity. To produce customer-oriented products is the philosophy of Airwheel with the aim to bring joy and fun to every Airwheel rider. Previous：About Airwheel S9 service robot and brand new C series.